Dublin playwright George Bernard Shaw’s approach to the art of mistake making still rings true 67 years after his death. And should he have lived to see the retail innovations introduced by fellow Dubliner, Thomas Ennis, it’s not inconceivable they could have warranted a mention in his works. Thomas, now 43, has spent a lifetime in retailing for his comparatively young age, with 28 years in the business. His career began with the iconic Superquinn, and it’s that experience Thomas believes gave him the tools to build his own network. After Superquinn, Thomas spent time in Eurospar with figures like John Fury, developing his knowledge and experience yet further and eventually culminating in Thomas opening his first store in 2005 – Spar Merrion Row. The Dublin City Centre store, with its spectacular brass sign, would prove to be ahead of its time, introducing innovations that, over ten years later, only now are becoming commonplace. According to Thomas, Spar is known as being ahead of its time, and it was his close relationship with the brand that has helped his business continue to push boundaries. “They don’t hold people back, and they’re constantly innovating,” he said. And one of the areas where that innovation is focused is food. Qualified chefs were introduced to produce food at an unprecedented quality for a convenience store, while Thomas’ shop was the first of its ilk to introduce an Insomnia Coffee offering and sit-down area. Thomas’ second store was a Spar in Celbridge, and it would be here the young retailer would learn some of his most valuable lessons. “It was where I’ve made the best, and the worst, business decisions I have ever made,” he candidly told Ireland’s Forecourt & Convenience Retailer. The opening of Celbridge would prove to be an important mistake for Thomas. The store succumbed to a combination of bad timing and a recessional beating, but Thomas would not be deterred. His next venture would be a major success, Spar in Upper Baggot Street. 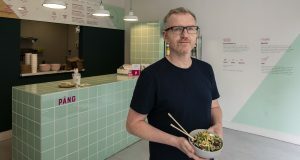 So successful in fact, that he would go on to open a second store in Lower Baggot Street that would push the network to another level. That store would be Spar Gourmet and, opening in 2012, it was the first of its kind. It has been a cauldron of creativity ever since, introducing new concepts, such as its recent Build Your Own (BYO) Burger, allowing customers to create burgers exactly as they like them using premium ingredients. Other openings would follow, in Mount Street Lower, and a number of forecourts. These would see the Ennis Group team up with Maxol in Mespil Road and Longmile. “We have worked very closely with Maxol, who in my opinion, are very innovative forecourt retailers, with fantastic vision of where they’re headed,” he said. Thomas’ resultant network now consists of seven Spars, two forecourts, and three delis, including the classy Füdi café concept. But even within this diverse network, store formats vary widely depending on the needs of the area, while Thomas is constantly keen to try new things, innovate, and take risks. The risk taking has paid off, with 60% fresh food participation in the Spar Gourmet store, while margins are in the region of 30% – a region in which many other retailers would like to reside. Thomas’ love for all things food extends to his enthusiasm for good coffee. This has manifested in his employment of nine fully trained baristas across his estate. “Along with our Insomnia Coffee offer, we have a team of nine baristas preparing quality coffees across much of the network,” he said. “In my view, good barista-made coffee is essential and well worth the extra effort. It complements our food offering and creates a complete offer. It shows we’re serious about delivering quality food. Thomas explained that the food offering among his competitors was increasing in sophistication, but competition is something he welcomes. “We’re surrounded by burrito bars among others,” he said. “But in my opinion, it’s a good thing. It helps develop the destination and creates a buzz around you. Ultimately that boosts the location and brings more customers to the area. Competition is good, and it pushes you forward. “For example, I operate a Chopped in Maxol Longmile Road, and it’s a fantastic and popular offering. It’s performing really well. Another important aspect for Thomas is service. As a “hands-on” operator, helping his staff deliver quality customer service is a high priority. But while hands-on, Thomas relies heavily on his leadership team. “We promote all our managers from within the store and offer a lot of internal training. I’ve built a very strong leadership team and developed a good structure to help me run the business: Sandra McCormick is the general manager, and she’s been with me from day one. Looking to the future, Thomas said the group is constantly looking to expand, but will lean on the experience he’s accumulated over his comprehensive career before taking the plunge. It’s another area where Thomas and the Dublin playwright agree. “There is no love sincerer than the love of food.” – George Bernard Shaw. Next: One week remains for Early Bird offer!